I get much of my inspiration from nature. I especially love all the woodland creatures, so I decided to design a line of pillow patterns based on some of my very favorite woodland animals. The first in this series is the Little Fox Pillow. 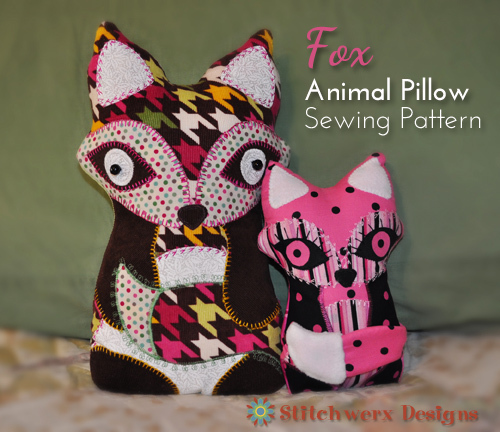 The Fox Pillow Sewing pattern is a really charming and versatile Animal Pillow Sewing Pattern. 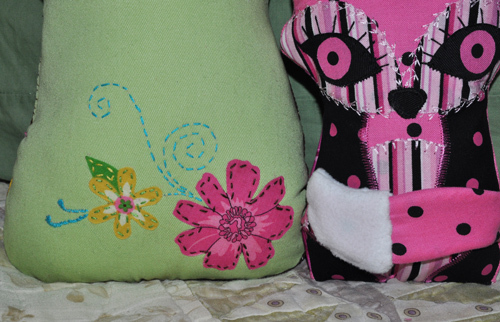 You will want to make several of these decorative pillows to adorn a couch, bed or even a shelf. Use your imagination to create a crafty little fox throw pillow for a custom home decoration. These unusual fox pillows would be a unique touch in a variety of places from a child’s room to your home office! This is a great project to use some of those fabric scraps you have stashed away. Just about any fabric type can be used. I have lots of cotton fabric, so I used that along with a bit of corduroy and fleece. 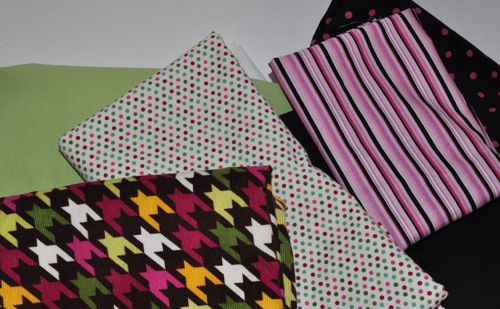 You can create many different looks and styles just by the fabric you choose. My 26 year old son saw them in my office the other day and asked if I would make one (in more masculine fabrics) for him. He likes greys, black, and red, so I’m thinking one in wool would be quite nice for him. Although the pattern printed at 100% size makes a finished animal pillow about 6.5 x 11″, you can use it to make just about any size pillow you’d like. Printed out small and crafted from felt, this little guy would make a wonderful Christmas ornament or scented sachet. Fill one with sand or rice for a one-of-a-kind door stop. Make two and you have bookends! I used my machine to applique the pieces on the front and some black beads I had in my stash served well as eyes. 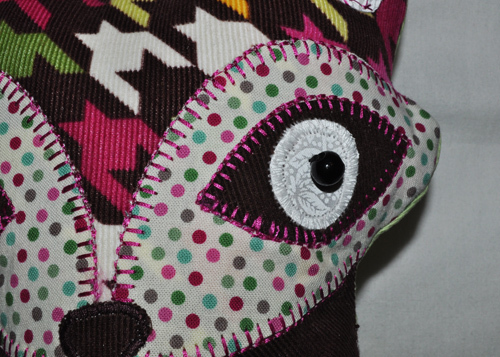 Of course, hand applique works great too-using a buttonhole or running stitch to attach your parts. I like using lightweight HeatnBond to attach my smaller pieces before I sew them. I like surprises, so I added flowers to the back of my little foxes with a touch of embroidery. On my smaller pillow, I decided to sew the tail separately and attach it on to add more dimension. The Fox Animal Pillow Sewing Pattern is available for $5.50 in my Etsy Shop. 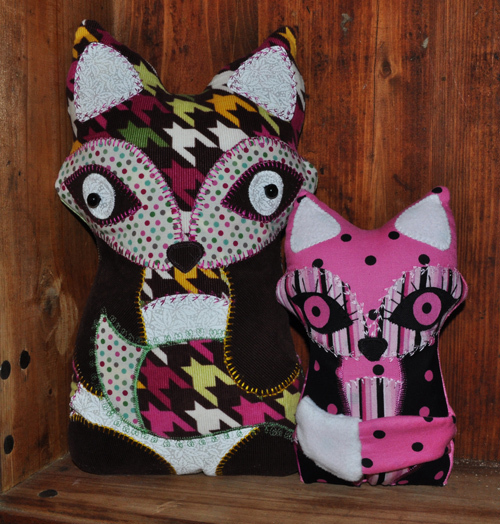 It comes to you in a pdf format via email, so you can start sewing your crafty little foxes right away! Stop by today to see all the latest crochet and sewing patterns at Stitchwerx Designs on Etsy! This entry was posted in Home Decorations, Pillows, Sewing, Sewing Patterns, Tutorials and tagged animal pillow sewing pattern, decorative pillows, fox animal pillow, pillow patterns, pillow sewing instructions, pillow sewing pattern, pillow sewing tutorial, sewing pattern, sewing pillows, stuffed animal, unique pillows. Bookmark the permalink.